Mail lite Padded Bags are the original protective postal bag: strong secure protection for valued items and peace of mind. The Mail Lite Padded Bag is environmentally responsible as it features macerated, recycled paper fibre padding which "puffs up" with use, and tough printable, pure kraft paper outer. This makes the Jiffy Padded Bag 100% recyclable. White Mail lite Lightweight Self Seal Postal Bags. Our lightweight bubble lined postal bags are ideal for sending delicate and fragile items in the post. The Mail Lite bubble bag range are available in 10 different sizes. Clear bubble bags in a range of popular sizes. 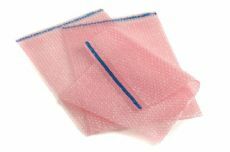 Bubble Bags have a self seal strip and 30 mm lip. Opening is on first dimension. Our clear bubble bags range are recyclable, reusable & biodegradable.